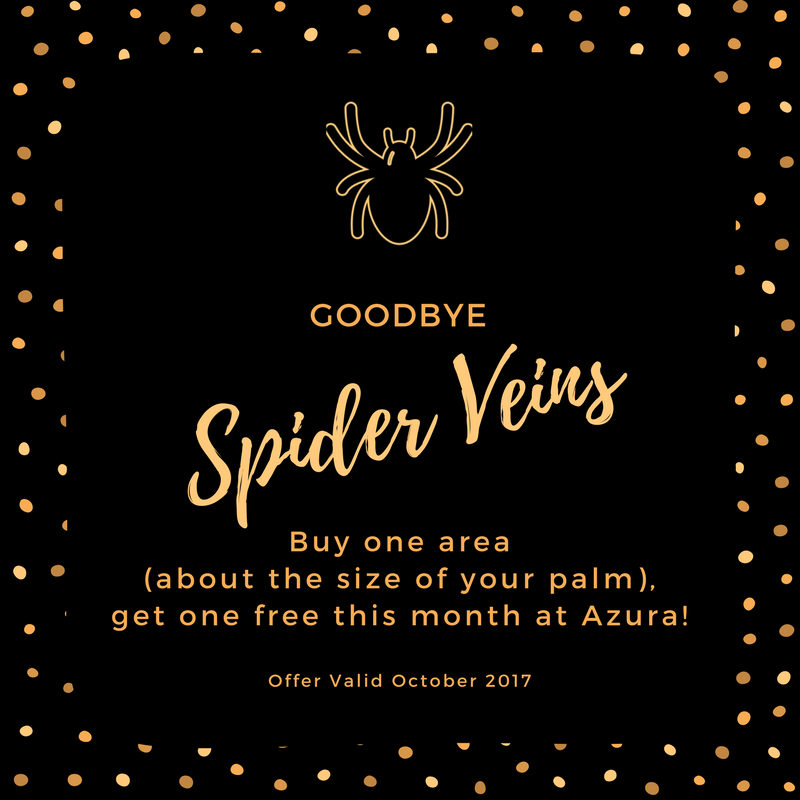 October 2017 – Botox, Spider Veins, and More at Azura! No tricks here, boys and ghouls – just great savings on BOTOX® and microderm treatments for two days only. 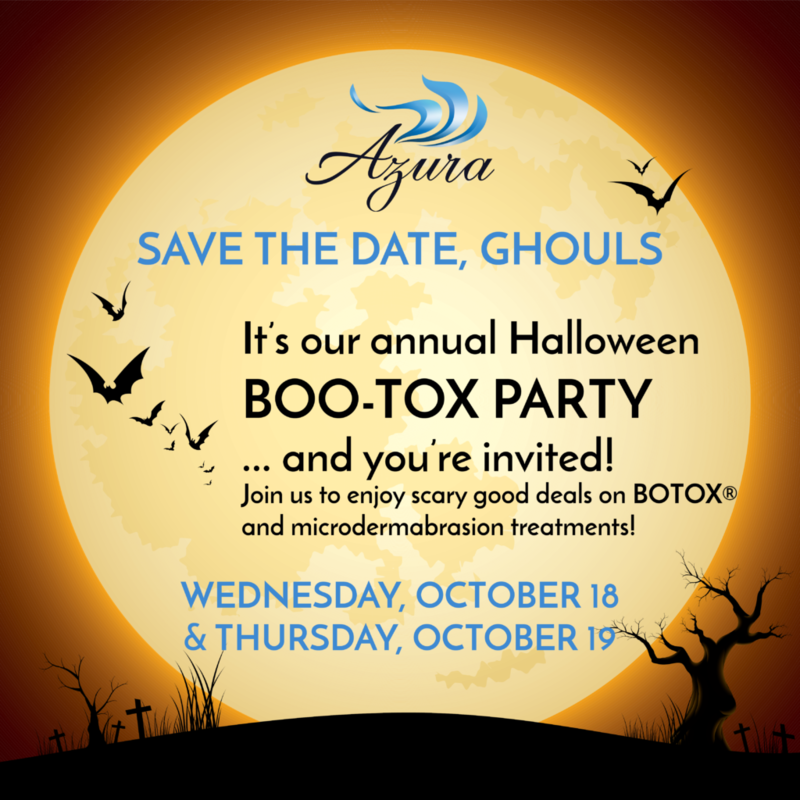 On Wednesday, October 18, and Thursday, October 19, visit Azura Skin Care Center for $11.50 per unit on Botox! Bring in a donation for the Models for Charity Fall Drive (more details below) and receive Botox for just $11.00 per unit during our Boo-Tox event. Plan ahead and you’ll be able to boost your savings when you schedule a microdermabrasion treatment prior to your Boo-tox for only $50! We’re coming for you with this month’s spider vein treatment special offer! Buy one area (about the size of your palm), get one free. Our talented aestheticians, Hope and Jordyn, love treating spider veins and can’t wait to help you ward off this unwanted spooky look. 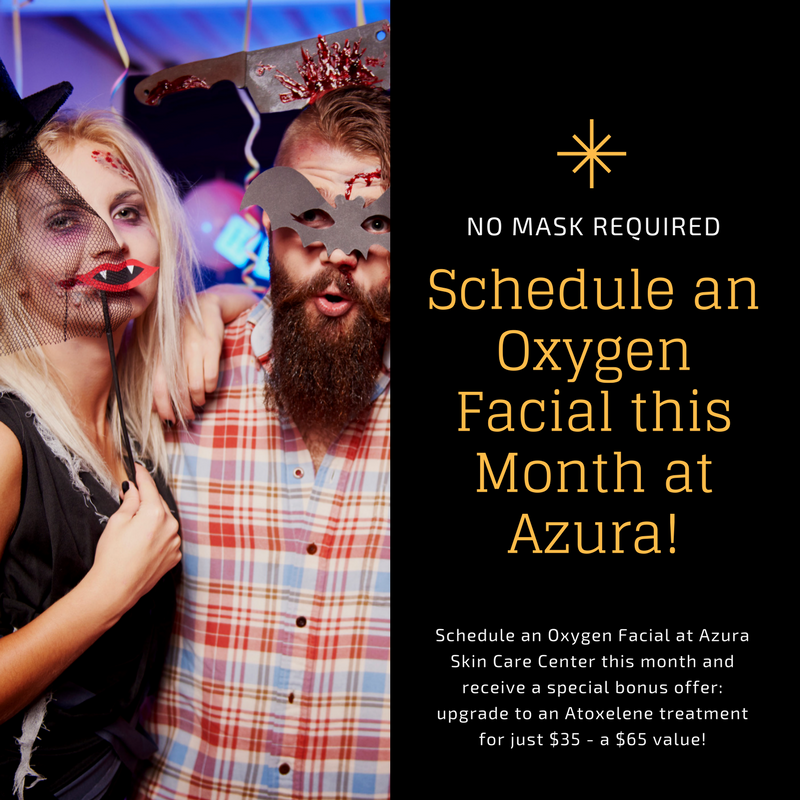 Schedule an Oxygen Facial at Azura Skin Care Center this month and receive a special bonus offer: upgrade to an Atoxelene treatment for just $35 – a $65 value! We will even send you home with a complimentary Atoxelene wand ($49) to use in the following weeks to continue to see improvement post-treatment. An Intraceuticals® Atoxelene treatment combines very well with our Rejuvenate or Opulence Oxygen treatments, providing increased vitality and hydration for the full face. With the added Atoxelene serum treatment, you will see exponential improvement and continue to improve your fine lines and wrinkles with appropriate at-home products. Out & About: We Have a New Miss North Carolina USA! As part of our support of the Miss North Carolina USA program as their official skincare provider, Jennie visited the Miss USA finals this past weekend and got to watch as our sweet friend Miss Katie Coble, Miss North Carolina USA 2017, crowned a new winner: Miss Caelynn Miller-Keys! Stay tuned as we are excited to get to work with Miss Caelynn in 2018 and share some of her skincare regimen and routine with you. Via Models for Charity: SAVE THE DATE!! I’ve seen a ton of posts about what people can do to help out in our community and those around us. Many of our local food banks have been sending food and resources to other parts of the U.S. that were hit hard by the hurricane/storms. Models for Charity will be hosting a canned food drive on Sunday, October 22, to collect canned goods for Western Wake Crisis Ministry. We will be serving up barbecue, beer, and our resident DJ will be spinning for the duration of the event. Admission is a bag or box of canned goods. The official invite and our sponsor partners will be out within the next few days. In the meantime, please mark your calendars and plan to attend or at least set aside your canned goods to deliver to one of our drop-off locations. Thanks! We’re so proud to be a drop-off location for this fabulous event helping neighbors near and far in need through the Western Wake Crisis Ministry – check them out on Facebook! Can’t make it out on October 22? Drop off your donations at Azura no later than Saturday, October 21, at 2 p.m. and we’ll gladly deliver them to the event on your behalf. As a special thank you, enjoy a Botox discount during our Boo-Tox event just for donating – or, receive 10% off any skincare product purchase this month! Have You Enjoyed Your Visits to Azura? 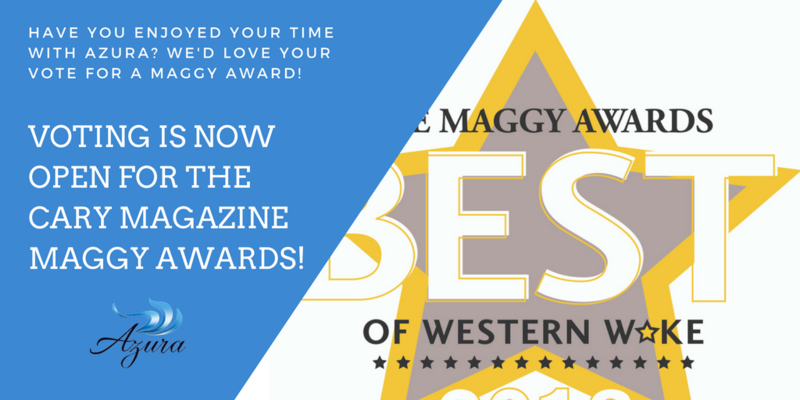 It’s time to vote for Cary Magazine’s next batch of MAGGY Award winners! If you’ve enjoyed your skincare experience with Azura, we’d appreciate your vote of confidence for us at https://www.carymagazine.com/features/maggys/.